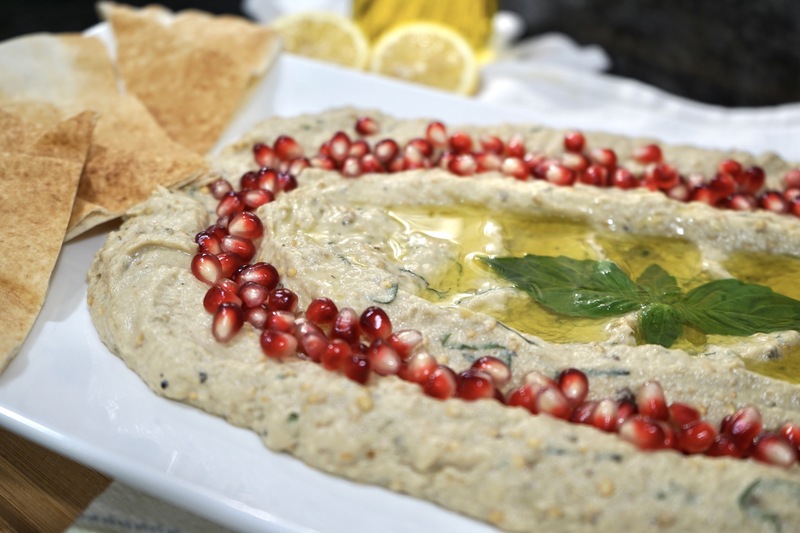 One of our favorite at home recipes is Baba Ghanouj. It’s so easy to make and tastes better than anything you’ll ever get out of a can. I learned this recipe from my mom. You’ll be surprised at the ease of making the it at home for friends and family. My mom is a stickler for authentic recipes so there’s no way she would ever use a food processor for this dish, or approve of adding basil. But as we get older and our palettes change, we like to push the culinary boundaries and explore our flavor options. One summer when we had an abundance of basil growing in the herb garden, we decided to chop some up and throw it in the baba ghanouj. The flavors married so well it became a staple in our recipe. 2 large-sized (Dark not white) Eggplants. ¼ cup Tahini Paste (100% ground sesame seeds), I like Lebanon Valley brand. 2 small Lemons, juiced (Freshly-squeezed). 2 Cloves Garlic, peeled and mashed into a paste. 2 Tablespoons fresh basil chiffonade or chopped. 1/4 cup pomegranate seeds for garnish. *Note: This is a base recipe for Baba Ghanouj, but it should be made to your taste. You may want more or less of the Tahini, Lemon, Garlic, Salt or Pepper. 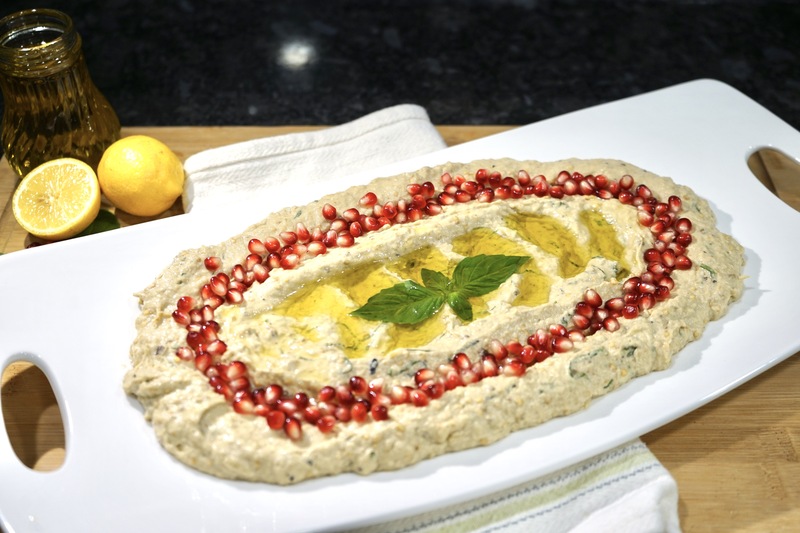 The Tahini paste settles to the bottom of the jar, so be sure to stir well before using. I add the Salt to the Garlic and use a Mortal and Pestle to smash the garlic and then use the Lemon Juice to wash out the Garlic paste from the Mortal bowl. 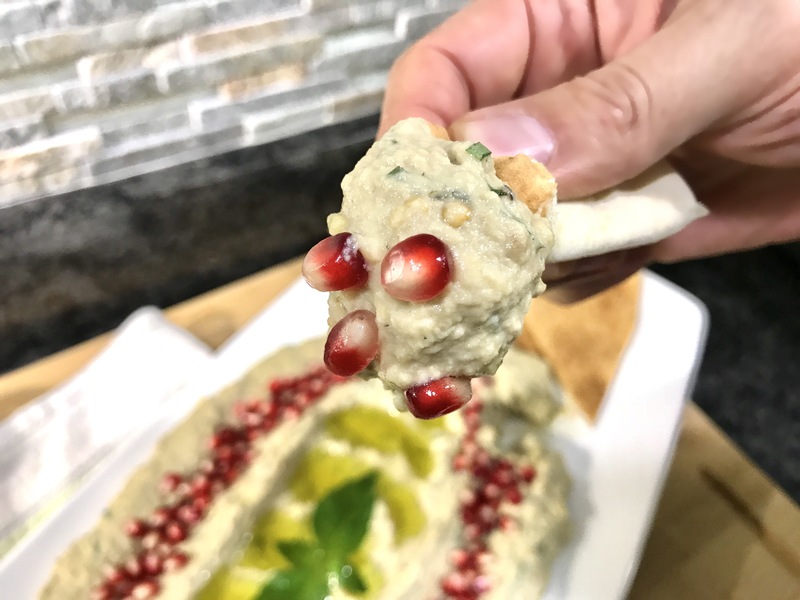 Also, and this is totally optional, I use about 2 Tablespoons of fresh chopped Sweet Basil mixed into the dip, garnish with pomegranate seeds and drizzle with Extra Virgin Olive Oil. The Basil is not traditional but highly recommended. Using a paring knife, cut off both ends and stab the Eggplants several times each, all around the body of the vegetables. This is to release the steam while fire roasting. Place the Eggplants on an outdoor grill or on top of a grate of gas top stove on High for 8 minutes per side, allowing the skin to burn and char. Remember you can’t have fire roasted Baba Ghanouj if the flames are not directly on the Eggplants. This is what will gives the dip its Smokey flavor. Place the cooked Eggplants in a large bowl to cool. Using a paring knife, peel the burnt and charred skin off, leaving the flesh and brown liquid of the cooked Eggplant in the bowl and discard the skin. Its okay if little specs of charred skin make it into the bowl, they will only enhance the smokey flavor. Add the rest of the ingredients (prepared as described above) and mix with a fork, for an authentic texture or for a smoother texture, purée in a food processor for 40 seconds on high. Taste and adjust seasonings as desired. Chill before serving and garnish with Extra Virgin Olive Oil, fresh Basil leafs and Pomegranate Seeds (Pomegranate Seeds are optional). Serve with fresh Arabic/Pita Bread. *Note: To make Hummus; simply replace the 2 Eggplants in this recipe with two 20 oz. cans of Chick Peas (Rinsed) and add 10 oz. of water in a food processor and puree until smooth.